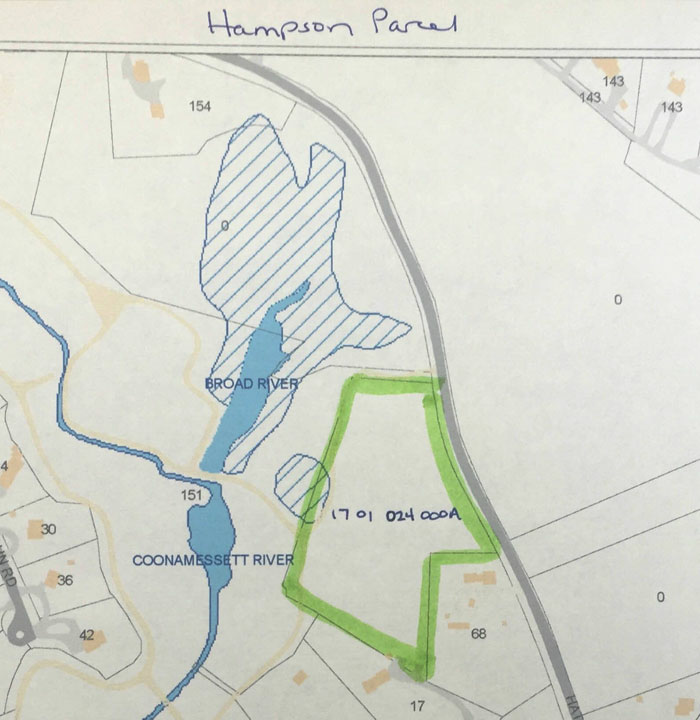 In 2006 Town Meeting appropriated The 300 Committee $550,000 toward the price of $650,000 for the Town’s purchase of 3.64 undeveloped acres on the south side of Hatchville Road overlooking the Coonamessett River. The 300 Committee had listed this property as a preservation priority as early as 1994. The BOS granted a conservation restriction on the property to The 300 Committee in perpetuity. The Hampson property provides wildlife and walking linkage to ninety-five acres of conservation land: the twenty-five-acre town-owned Matt Souza Conservation Area; the sixty-two-acre Dupee property and adjacent seven-acre Toner parcel, as well as the town cranberry bogs along the Coonamessett River. Terrain ranges from wetlands to woodlands to grasslands, with a large number of native plants and a wide variety of birds. It also contains upwelling spring waters that fill a small valley and create an elongated pond known as the Broad River.